In the late 1990s, pro wrestler Steve Austin became the largest financial draw in the history of his sport. This happened through happenstance as the entertainer began to create a new character he modeled upon a professional serial killer. To his and everyone else's surprise, the bad guy became one of the most successful fan favorites the sport has ever seen. Audiences across the world enjoyed watching someone who is ostensibly evil throw a beating on those deemed deserving of cruel and unusual punishment. The most surprising aspect is that no one had ever succeeded with this sort of gimmick before, because it is the wildly successful foundation of the Friday the 13th and Nightmare on Elm Street franchises. Equally surprising is that it has taken this much time for the oft-rumored Freddy vs. Jason rumble to reach the big screen. Now that the day has come, though, I can honestly say that despite numerous moments of painful dialogue and wicked bad acting, Freddy vs. Jason delivers on its promise of entertainment and surprise. I should state early on that if you are not a fan of the films in both franchises, this one is certainly not for you. All of the hallmarks of both series are prevalent. Teen actors and actresses who have no business getting work in the thespian profession are cast because they fit the three simple maxims of horror screening. These kids are cheap to employ, they look hot, and they are unafraid to ditch their clothing at the drop of hat. It's enough to make an aging critic nostalgic for the day when a part in one of these Nightmare on Elm Street films was enough to qualify you for a recurring role on Just the Ten of Us. If you are able to get past the excruciatingly bad acting along with a slow to develop plot, what you are left with is surprisingly enjoyable. For the first two acts of Freddy Vs. Jason, every cliché from the teen slasher genre is celebrated. It’s an intentional choice by director Ronny Yu to offer an homage to all of the classics from the series before moving on to the bigger and better New Ideas he has for the future of the series. While still embracing the flaws of the earlier hallmarks of each franchise, Yu’s fingerprints of invention are all over the final phase of the film. All of the anticipation is finally given a payoff in the form of a physical confrontation between the two horror icons. It is at this moment that the teen slasher genre experiences something it hasn’t known in quite some time: the element of surprise. For a frenetic half hour of cinema, there is no way to be certain exactly what is going to happen next and it’s this rediscovered energy that invigorates a tired film concept. I expect that not everyone will be happy with the outcome, feeling that the payoff might not be as profound as the foreplay prior to it. Speaking only for myself though, I was ecstatic with the forethought placed into what the strengths and weaknesses are of each character. Jason is the Superman, a bastion of invincible strength whose vulnerability lies in his (lack of) intelligence. 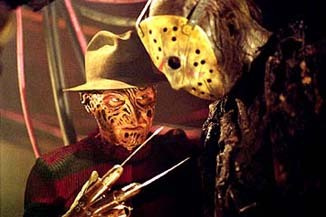 Freddy, on the other hand, is the cerebral assassin who must outwit in order to outlast. Each is given ample opportunity to lay waste to the teen victims, who are effectively the zebras in this Serengeti of all-powerful lions and hyenas, but when they are paired against one another, the wrestling heel/face metaphor is applicable. The killer originally designed to be the ultimate bad guy manages to become a sympathetic figure for the audience to proudly root for while the other manages to dissuade people from wanting him to win. This is due to the unexpectedly deft touch of Yu, who recognizes that one of them needs a bit of redemption in order to make this new franchise concept work. All of this is largely irrelevant, though. Freddy vs. Jason is one of those rare movies that is completely bulletproof with regards to reviews. Anyone reading this is probably like me, a huge horror buff who is going to see the film no matter what. The good news for you is that you won’t be disappointed. To make the night out at the movies even better, though, I highly recommend taking your most quip-riffic friends as there will be ample opportunities for mocking during the festivities. You will definitely want your quick-witted pals by your side to maximize what is at its core potentially one of the most enjoyable movie going experiences 2003 will offer. It should be a definite group thing. And make sure to scream once for me.